For over 3000 years, we have been hanging wreaths in our entry-ways and on the doors of our homes. Originally, garlands and wreaths were hung as a sign of victory and celebration after the athletic games, which eventually became The Olympics. Interestingly, wedding veils also stem from the same custom of celebration: they illustrate the woman’s status and pride. These types of traditions evolved into our hanging of wreaths for holidays — especially Christmas. 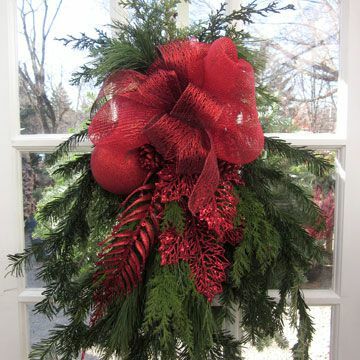 Both wreaths and swags can lend welcoming seasonal flair to our front door. 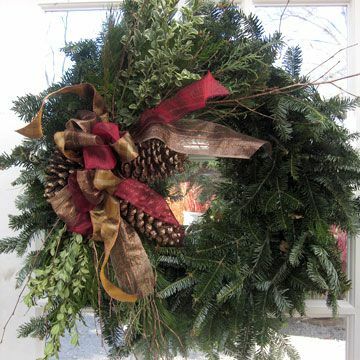 Wreaths are usually based on pre-made evergreen fir branches twisted and wired to a frame. Door swags are bundles of greens that hang downward. As we talked about in the Porch Pot article, start with your theme. The color of your ribbon is an easy place to start. Traditional red is easy to see from the street, but a natural winter can also be beautiful. Add glitz and glamour by using bright colors like copper and even magenta or lime. When an order comes in for a custom “make it fabulous and over the top” wreath in our decorator’s workshop, we call them “Mae West’s” as she was very big on personality! To start, use an unembellished Fir wreath. The most common size is our 22″ wreath but we also have 16″ and 26″ wreaths available. Then choose at least three other types of greens to add different colors and textures to the wreath base. Try one or two longer draping varieties, such as bright Variegated Cedar or the silvery quality of Port Orford, with an addition of fillers such as White Pine Tips or Oregonia. Oregonia looks similar to Boxwood, but is green and white, and brings in a nice touch of crisp color. Blue Cone Cedar has great drape and tips of tiny cones. Give your wreath some direction and form by adding some more structural elements. Curly willow branches create movement. Colored twigs, whether natural Red Twig Dogwood or sparkled and painted branches, can bring out the color theme. Be creative with additions of pine or sugar cones. Sugar cones are one of the biggest cones, about 10” long. And don’t forget the bright red Winterberries! You can also wrap your wreath with battery-operated light stands to make it twinkle in the dark. An easy way to set up a wreath is to view the circle as a clock face, with the top where you will place your hanger loop on the back at “12-noon”. The area where you will place your focal point will be about “10-pm”. Think of this focal point as a bouquet. The ribbon bow is added as a final touch in the center to cover the cinched greens. We use a long plastic zip-tie to anchor the items in place. Start with the greens. Work from the outside in with the longer draping greens at the base and the shorter cuttings close to the ‘center’ of your bouquet. Save the twigs and embellishments for last. Swags are basically greens layered flat from a top point. They can work where a wreath can’t — in a narrow place such as under your coach lights, either side of the garage, or tied to a lamppost or a curbside mailbox post. Swags can be made in a wide range of sizes. Smaller ones (about 12 inches or so) are suitable for small spaces or larger ones (up to 3-foot lengths) which are best for a door or against a wall. Starting from this top point, place your longest greens slightly fanned out. We suggest you use a base of a large Fir bough. Then, layer additional greens and add the twigs and cones or other accessories. Cinch this grouping loosely at the top with a zip-tie. Then camouflage the top cut ends by tucking in some small pieces of greens, about 6” long, as a little tuft above the zip-tie. Once you’ve added all your greens and embellishments, cinch this tight and add your bow and hanger on the back. To make all of this much more simple, attend one of our Wreath, Container or Door Swag classes. There are still 3 spots open in Naperville on November 22 and openings in both the Naperville and Aurora classes on November 29. We’ll show you how to do all of the mechanics, including how to make a bow. You’ll leave with a finished item, ready to hang! Happy Decorating!